Boycotting or voting doesn't change the fact that these elections are illegitimate. Egypt's 2011 elections are a complete joke and it's not even funny. The ruling military junta is illegitimate. The current rulers have no constitutional standing and were handed power illegitimately by Mubarak. They have killed and tortured our youth, betrayed our trust, degraded our women and subjected them to humiliating virginity tests, disrespected our votes and brought no justice or peace. Setting aside the illegitimacy of the SCAF, there are numerous other reasons. Even if our rulers were legitimate, they have an obligation to respect human rights, democracy and the Egyptian vote. The military have disrespected the referendum and provide no reason for us to believe they will respect our votes in the election. The SCAF seemed to have killed their own people in order to force 'democracy' down their throat. If the will of the people had any weight, elections wouldn't have taken place after the police murdered numerous unarmed protesters. Even if we set aside attitude, for elections to be legitimate they must be agreed on by the Egyptian people. The people were never asked, and when they voiced out their demands, they were never heard, and even when they were heard, they were never listened to and never was any action taken. So what we have here are elections put forth by a dictatorship that does not respect the various opinions of its citizens; could such a dictatorship ever respect their votes? Furtheremore, it is difficult to convince yourself or anyone that these elections have any legitimacy when half the people are afraid to go out and vote due to justified security reasons. How can those brave voters be accountable for their vote? Where, when and how has information regarding the elections, the rules and the candidates been made available? Most voters are placing their votes as they do with bets on a roulette table. It is a complete gamble due to the murkiness of the electoral process and the availability of information. Setting aside all the above, even if parliament were formed without rigging, it would be impotent. They have no power to fulfill their promises and they would be used as a front for SCAF. People are to direct all their anger towards the powerless parliament. This makes the future parliament illegitimate because it will fail to represent the people. Voting or boycotting will not change the illegitimacy of these elections. It is enough that a great number of people feel that the laws are not fair and that the time isn't right and that the rulers are biased towards their self-interest. You may vote to lessen the blow and you may boycott to prove a point, but that isn't the real crux of the matter. So if to vote or not to vote is not the question, what is? The real question is whether you're selling out. Neither action determines that. 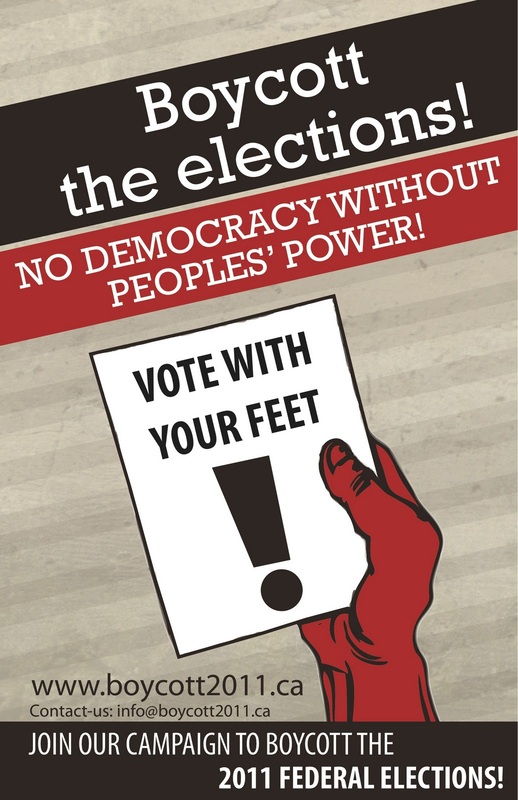 People have died for democracy, and democracy isn't unfair elections. Democracy means justice, respecting minority rights, respecting human rights and allowing others to take part in the decision making process. We haven't had democracy yet, and so the votes won't matter. We can't have elections and democracy as the junta and police kill protesters and disrespects citizens. How will a vote be respected by these people if a human life is not respected? These elections are not what people died for. There is no honor in accrediting something as farcical as these elections to their death. The important thing is to remember what they died for. They died for bread, freedom, social justice and dignity. There is no dignity in running rapidly like a rat through a fore drawn maze. You don't sell out by voting or boycotting, you sell out when you settle for less than what thousands have died for. 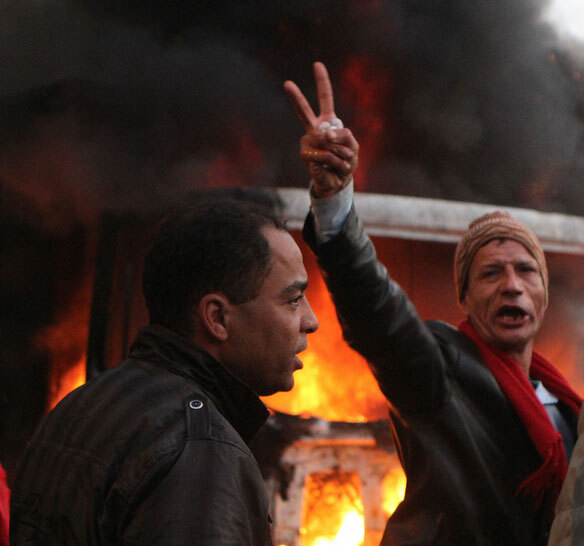 Protesters flock to Tahrir square in search of what’s left of a revolution hijacked by the military council. The attitude is comparable to that in the January revolution. It an attitude of determination to choose some sort of freedom called for since Januray. For months protests have been tip toeing around the main issue which is the SCAF, but it seems that this time there is a direct resolve for the military to hand over power with a sense of immediacy. The military has squandered trust very efficiently over the past nine months and the extreme violence with which the protests have been handled have done little to restore it. People are now speaking against the military, but it's been a long time coming with a very strong build up ever since the military assumed power. The 18 November protest was advertised for some time, and that gave people a chance to accept it. When the security forces clamped down on it, it was unacceptable. It seems that the security response is comparable to January and February but it's a lot more brutal. They have been targeting media personnel not just with arrests but with ammunition. A few activists and media personnel lost the use of at least one of their eyes and many have been injured. This time they were aiming for the eyes and the chest directly using rubber bullets, shotguns and birdshot. As usual, the government is commending the ministry of interior despite tens dead and thousands injured. So we have pretty much the same government response as in January. The Muslim Brotherhood are not part of the protests this time, many of their members have gone to the square in defiance of the orders given in order to stand with the protesters under brutal attack. Will elections move forward? That's a difficult question to answer. The SCAF is in a precarious position. The new election law will not give any one power complete dominance over the parliament. They cannot take sides against the remnants of the old regime because they themselves are implicated and will be exposed if they do. I don't see how nationwide protests can end without the military stepping down. The numbers are growing and so is the resolve. The government hasn't learned anything at all, they've been using the same techniques throughout their reign. It is unlikely that reforms will solve this situation, they need to trick people again, but honestly i don't think they have anything left up their sleeve. They could have pretended to play nice till elections, after which all negative sentiments could have been directed to the parliament. Also they've made parliament a three step long winding process, so the results will show in January at the earliest. I don't think they'll survive that long. I'm sure as we speak, their Israeli allies are thinking up some clever scheme to resolve this volatile situation. We’re at a stand off now. The SCAF squandered almost all of its chances of safe exit committing atrocious crimes added to those committed during Mubarak’s reign. They fear arrest if they step down and so will cling to power with all their might. They would have ordered the whole square bombed had they not feared retaliation within the army if such a command is executed. Their cards have been burnt. Sharaf, the media, the Muslim Brotherhood, the Salafis and many other political parties have been exposed as loyal to power rather than the people. The SCAF placed their bets on everything but the people. The Muslim Brotherhood, the Salafis and all the political parties have placed theirs on the SCAF. The result is that of two delinquents masquerading as artists praising one another’s disdainful works. People also have no choice but to remove the SCAF from power. If people return home all that’s left of the revolution will be violently targeted. Fear will drive SCAF to lunacy and they will not try to crack down even more violently and blatantly on anyone propagating ideas of dissent. That’s why there is no turning back. There will be a long battle for survival; it’s either the regime or the people’s will to break free of their bonds. On 27 October 2011, 24-year-old Essam Atta was allegedly tortured to death by prison guards. Despite Atta’s family alleging that a prison officer called Nour was involved in Atta’s torture, the police have not investigated these allegations and concluded that Atta died as a result of ingesting drugs. The Ministry of Interior statement and the forensic report are reminiscent of the official story onKhaled Said, who was murdered in plain view and whose autopsy report had been falsified. The case is currently being examined by the general prosecutor. investigations alone and ended exonerating the army. Instead of a full-fledged investigation, revolutionary activists have been summoned to appear before the military prosecution. Activist Alaa Abdel Fattah was detained by military prosecution on serious charges yet no evidence has been presented to the public. General Mohamed El-Assar claimed that army personnel were unarmed and yet one of the charges against Abdel Fattah is theft of a weapon belonging to military forces. In addition, according to Bahaa Saber, another activist who was summoned but released after questioning, the army has Mina Daniel’s name on the list of those accused. Mina Daniel was one of the activists killed on 9 October. His autopsy reports the cause of death as: “projectile entered into the upper chest, exiting the lower back”. Nakba Day on 15 May witnessed protests outside the Israeli embassy in Cairo in solidarity with Palestinians. Demonstrators were dispersed using live ammunition, tear gas and rubber bulletsleaving 350 people injured. Over 150 arrests were made. It is unclear until today why the army used excessive force. On 9 March, the sit-in at Tahrir Square was dispersed violently with reports of mass arrests and torture in the vicinity of the Egyptian Museum. Virginity tests were also carried out on female detainees as reported and documented by the El-Nadeem Centre for the Rehabilitation of the Victims of Violence and Torture, Amnesty International, The Washington Post and CNN. The army initially denied that the tests had been carried out, and then promised to launch an investigation. Numerouscalls to bring those responsible to justice have been ignored despite numerous eyewitness accounts and evidence. Corruption, abuses and miscellaneous others February 2011 – to date.